This season, try out any of these 3 gorgeous smokey eye makeup looks. Now, attend summer parties in style! Summer is here and it’s time to get the party started. Bring out the floral dresses, the colorful flip flops, the citrusy scents, and of course the bright makeup products. One of the hottest trends doing the rounds this season is the smokey eye. But it can be a little daunting if you don’t know how to apply it. Well that’s what we are here for. We decided to put a new spin on the traditional smokey eye and here’s presenting three new looks for you to try this summer season. Bronze and coppers are a great summer color to get your glam on for the lazy Sunday brunches. Step 1: Start by applying a primer on the eyelid and lower lash line. Define your eyebrows with a brown eyebrow pencil. Use a color that is closest to your natural brow color. Step 2: Using an eye shadow brush apply a golden bronze all over your lid to the crease. Using the other side of the brush take a darker brown such as a copper color and apply it on the outer corner of your eyelid. Use a fluffy brush and blend the colors together up to the crease to create a seamless gradient effect. Step 3: Next take the darkest shade of bronze and apply it along the crease with a light hand to contour the eyes. This will help create the smokey effect and add some dimension to the eye. Using the same dark brown apply it in a thin line along your lash line and water line as a liner to balance out the smokey effect. Step 4: Now take some of the original golden bronze color and apply it to the inner corner of your eyes. The light color stands out against the darker shades and makes your eyes look brighter. Step 5: Finally use a liquid liner and draw a precise line along your eye lashes. You can even extend it a bit to give it a dramatic cat eye effect. To add the finishing touches curl your eyelashes and use a voluminous mascara to flaunt your gorgeous eyes. It may be time to party, but work also still needs to be done. That doesn’t mean you can’t style your peepers when you head to work. Complement your summery work outfits with a subtle neutral smokey eye for a gorgeous day look. Step 1: Pick a neutral eye shadow palette with whites and light browns. Start by filling your entire eyelid with an ivory base. Blend it well so it does not look jarring. Next take a brighter white and highlight the bone just under your eyebrow. 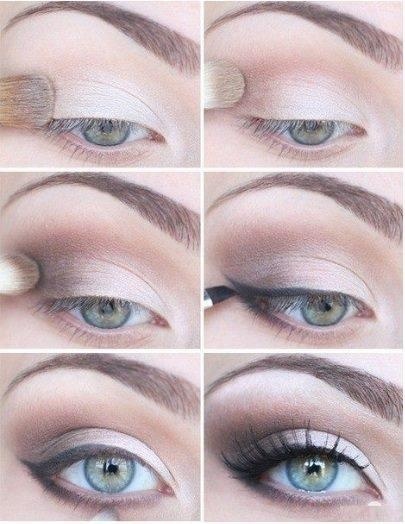 Step 2: Take a light brown shade of eye shadow and apply it on the outer lid. While you are blending it sweep some along the crease of the eyelid with a soft touch. Blend the color with outward strokes on the outer corner. Then take a flat brush and apply the brown lightly under the lower lid. Don’t make it too dark or it may look like you have bags under your eyes. Step 3: Finish off by applying a thin stroke of liner on your upper lid and on the outer edges of your water line. Smudge it a little to give it a smokey effect. Finally add mascara to your upper and lower lashes to emphasize and open up the eyes. Remember to keep your lip color muted for office days. Opt for neutrals in brown or peach which gives you an almost no-makeup look. After a long week you need to let your hair down with some fun. And what better way to throw your cares away than with a fabulous summer night party. Pick your favorite dress and jazz it up with stunning blue eye makeup to suit the summer colors and no one will be able to take their eyes of you. 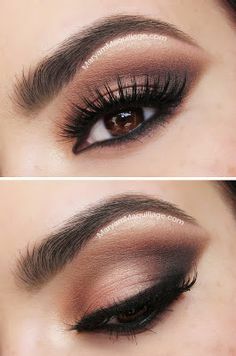 Step 1: Start by prepping your eyelids with a primer and then brush some loose shimmer powder on the entire lid as a base. Then take a soft blue eyeliner pencil and draw a line starting from the center of the eyelid outwards. Draw it like an arrow pointing outward with the outer end thicker than the inner one. 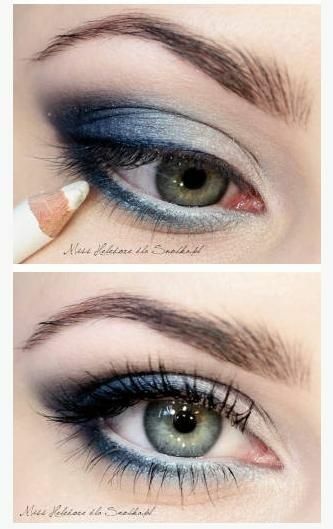 Step 2: Take some matte blue eye shadow on a flat brush and spread it along the eyeliner you have applied. Using a rounded brush slowly blend it in. Smudge it in a way that a little bit of blue shadow spreads towards the inner eyelid but still remains faint. Focus on making the outer lid darker. You can use a combination of a lighter and darker blue to get the desired effect. Step 3: Next take the darker blue matte shadow and apply it from the outer corner along the crease of the eyelid and blend it lightly for a seamless look. Step 4: Now take a mineral (with flecks of shimmer) eye shadow in ivory or silver and apply it from the inner corner to the center of the eyelid and blend it lightly with your ring finger. Step 5: For the finishing touches, take the blue eyeliner pencil and draw a thin line along the upper lash line. Draw a stroke just below your waterline with a little bit of blue eye shadow for a smudged effect. Next use a white eyeliner pencil in the inner corner of your eye and along your waterline to illuminate your eyes and make them sparkle. Swipe some mascara on your curled lashes and you are all set to make everyone freeze in their tracks.